Kaysville parents objected when kindergartner brought home In Our Mothers' House. "In Our Mothers' House" by Patricia Polocco was placed behind the counter at Davis School District libraries after parents complained about its content. Courtesy image. 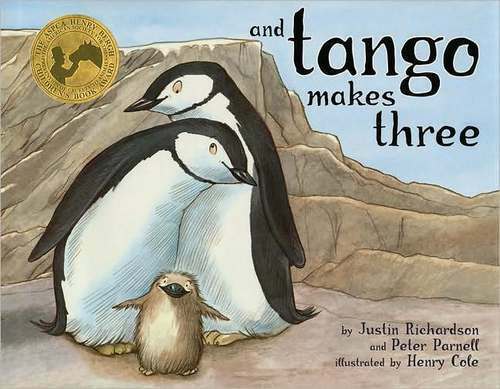 The book "and tango makes three" by Justin Richardson and Peter Parnell, about two male penguins hatching an egg has regularly appeared on banned book lists. Courtesy image. 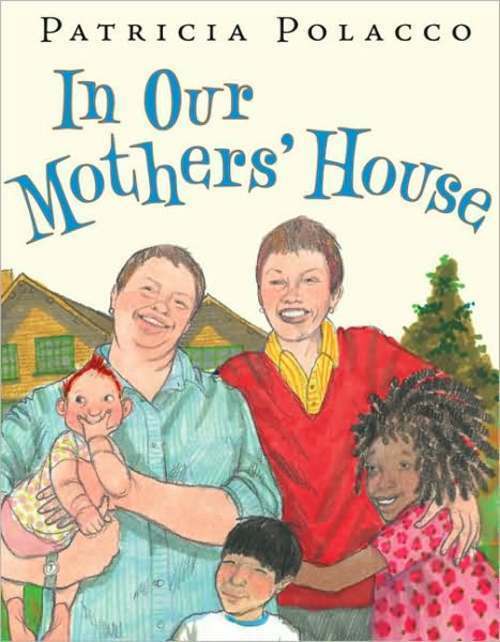 A picture book about a lesbian couple raising a child was removed from the shelves of elementary school libraries in Davis County after a group of parents raised objections about the suitability of the story. In Our Mother's House by Patricia Polacco remains accessible at schools in the Davis School District, but only if a student presents a permission slip from a parent to check out the book, said district spokesman Chris Williams. The decision to keep the book "behind the counter" in libraries followed an April 30 meeting during which a seven-member committee determined the book didn't align with district curriculum standards. The committee, comprised of teachers, administrators and parents, voted 6-1 to keep the book off shelves, with a high school librarian casting the dissenting vote. "State law says schools can't have anything in the curriculum that advocates homosexuality," Williams said. "That is why it is now behind the counter." Concerns about the book bubbled up in January, when the mother of a kindergarten student at Windridge Elementary in Kaysville became upset when her child checked out the book and brought it home. The mother and her husband brought their concerns to elementary school officials, according to Williams. A committee at the school level decided to move the title to a section of the library for grades 3 to 6, after determining the book  recommended for students in kindergarten through second grade  was better suited for older readers, Williams said. That didn't appease the parents of the kindergarten student, who gathered 25 signatures on a petition to move the discussion to the district level. The district committee voted in April to place the book behind the counter. Parents who signed the petition were notified of the move earlier this month. .
Williams said the book was purchased in part because a student who attended Windridge Elementary has two mothers and librarians wanted to foster inclusion. "While we've restricted the book, this book is still available," Williams said. The district's decision indicates there is more work to be done in Utah to promote understanding of the state's increasingly diverse communities, said Brandie Balken, executive director of Equality Utah. "My first take is this: Parents have and should take seriously the importance of speaking to their children about their families, their history and their deeply held personal values. But as a community, we have a responsibility to hold open a space for children to accurately understand families, history and personal values as they actually exist in our diverse community," Balken said of the district's decision to limit access to the book. "I think at its core, it's important for us as a community to be committed to all children feeling like their families are valuable. And that they are safe in being their full selves at school," she said. Polacco offers a description of the book, published in 2009, on her website, http://www.patriciapolacco.com. The book has been banned in other U.S. schools, including in several Texas districts. "Marmee, Meema, and the kids are just like any other family on the block. In their beautiful house, they cook dinner together, they laugh together, and they dance together. But some of the other families don't accept them. They say they are different. How can a family have two moms and no dad?," the description states. " But Marmee and Meema's house is full of love. And they teach their children that different doesn't mean wrong. And no matter how many moms or dads they have, they are everything a family is meant to be." Polacco's tale joins other popular children's books that explore LGBT themes, including And Tango Makes Three and Heather Has Two Mommies, which routinely grace the list of often-banned books. Heather Has Two Mommies, published in 1989, is the story of a child whose biological mother gave birth to her after artificial insemination. The girl is raised by her mother's partner. The book is ranked in the top 20 of the most frequently challenged books in the U.S., according to the American Library Association. And Tango Makes Three, published in 2005 by a gay couple from New York City, has also proven controversial. The book is based on the true story of Roy and Silo, a pair of male penguins in the Central Park Zoo who tended to an egg in their nest until it hatched. The egg came from another penguin couple, which struggled to care for two eggs. Zookeepers named the baby penguin Tango when it hatched. Williams said he's heard rumblings that some parents in the district are also concerned about And Tango Makes Three. But so far, those concerns haven't reached the level of organizing a panel to discuss the book's content, he said. Other books have been contested in Davis County schools in the past. More than a decade ago, some parents were troubled about violence in a 1971 book titled Grendel by John Gardner. John Steinbeck's Of Mice and Men, along with J. K. Rowling's "Harry Potter" series and Stephanie Meyer's "Twilight" series, have also sparked parental concerns over the years, Williams said. Those books were never removed from shelves, however. Williams said district librarians look at several factors when choosing books, including state curriculum recommendations, suggestions from colleagues, student recommendations and lists from the American Library Association. He said school librarians have "a lot of autonomy" in the books they choose. He said the district hasn't received any complaints from parents about Polacco's book being placed behind the counter.